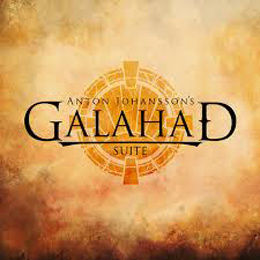 It seems Anton Johansson, who is an ex Mister Kite member, had been running around with the idea for this ‘Galahad Suite’ for almost 30 years. And now finally you can find it in album form. It is near impossible to fit this album into one niche, since it’s sound is very versatile. One song tends more towards progressive rock, the next is more melodic, there’s even some hard rock thrown in between. Symphonic elements are also there. To sum it up : this is not a very heavy album, but it is very good nevertheless. Somewhere it reminds me of rock opera’s like Ayreon. The theme of the album, is of course, Sir Galahad’s search for the Holy Grail, with all it’s ups and downs. For those of you whom might not know the story, Sir Galahad was one of the knights of the round table. The musicians on this album know very well how to handle their instruments, and on top of those, there’s a whole list of guest musician’s, who also are well versed in their art. The music on this album is sheer heaven, a good combination of fantastic guitar work, good vocals, and to cherry on the cake for me are the keyboards, who are very predominant, but not overly predominant. The songs themselves are also beauties, and to top it of the lyrics are also great.